Hes stared into the Monkeycam and lived to tell about it! 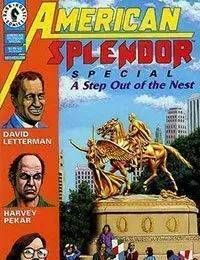 Critically-acclaimed comics writer Harvey Pekar returns to the racks with his first 32-page comics story ever. It chronicles Harveys adventures in New York City last spring as hes invited to appear on Late Night with David Letterman after a four year hiatus - only to be bumped at the last minute by Barry Manilow! Will the fists start flying? This special stand-alone storyline is full of the gentle wisdom and understated irony for which Pekar is renown.